Hiking and camping in the wild can be one of the most thrilling and relaxing experiences you can have. Striving to keep a healthy balance between time spent indoors and outdoors is probably the most rewarding effort you can make in your lifetime. The only problem that deters some from camping out more often is the possibility of bear encounters. Luckily, nowadays it’s easy to stay out of danger with the help of bear spray. Just grab a can of this highly effective deterrent when packing for an outdoors trip and keep it at close range while hiking. 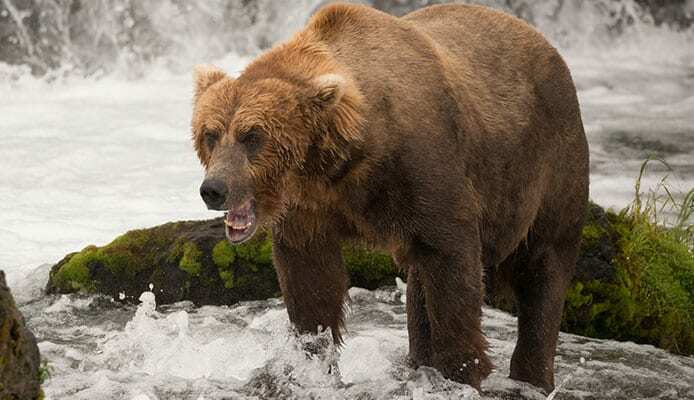 To help you choose the best option, we’ve looked closely at the best bear spray products available and analyzed them in this guide for all outdoor enthusiasts. 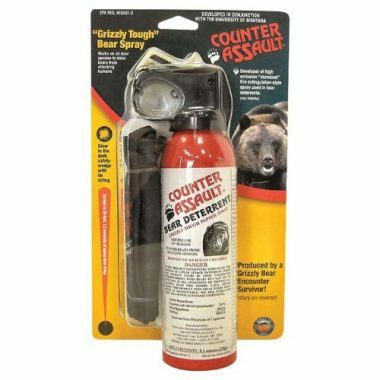 This grizzly-level strong pepper spray from Counter Assault is one of the best bear mace products on the market. Featuring a concentration specially formulated to ward off the strongest animals, it can protect you instantly should you need it. 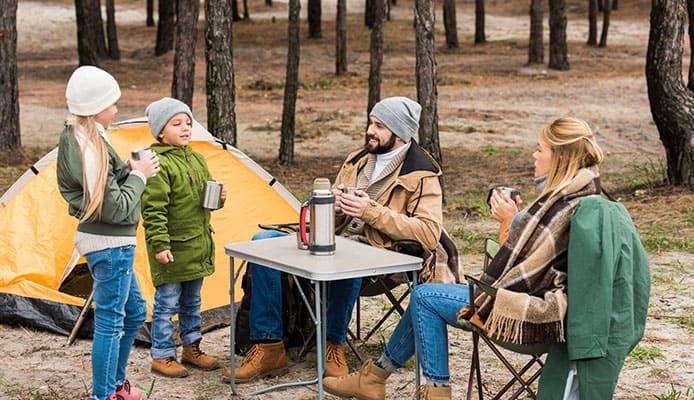 It’s a great choice for campers and hikers, since the bear pepper spray comes in a sturdy nylon bag holster and a belt hoop so you can wear it securely. No rummaging around through your backpack if you come face to face with a bear! According to high-profile bear spray reviews and to our own experience, this is the brand of bear repellent that is carried by the most experienced hikers and campers. If you venture in the Yellowstone region, you’ll see that most of the people you encounter carry a can of Counter Assault bear pepper spray with them. 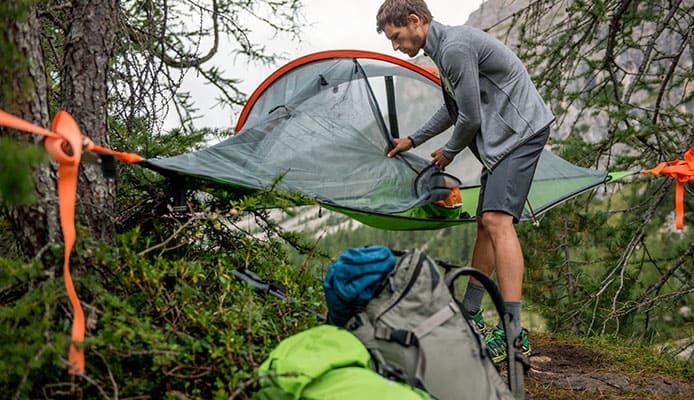 It’s indeed the go-to for hikers and campers in areas with lots of bears, because it’s simply the best option on the market. Among the top-rated bear mace products online, the UDAP formula gains extra points in our book because it’s been developed by an actual bear attack survivor. Considered by many to be the best bear spray formula available, it produces a strong fog that makes even the most fearsome animal helpless and drives it away. It disperses a large concentration of inhalable particles in a shorter time than other formulas, making it the best spray for hiking if you’re especially wary of bears in the area. Also, according to bear spray reviews and consumer polls, UDAP is the most trusted brand in the market. 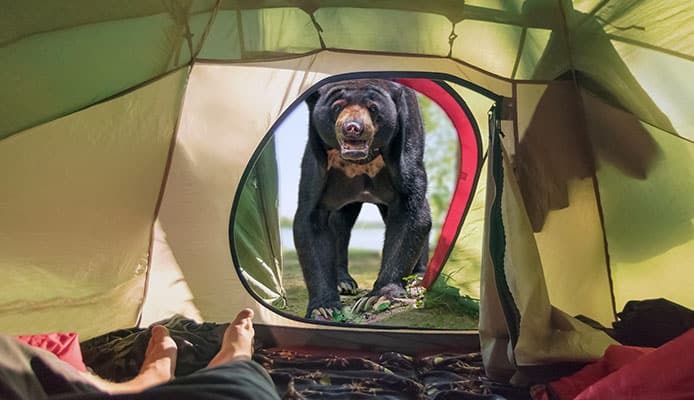 Advertised as the hottest concentration of bear-repelling substances allowed by the law, it definitely makes you feel more confident to go out camping. One of the most affordable formulas when it comes to the best bear spray options, this Frontiersman bear repellent is still an effective product in spite of its relatively low price. Just like the other highly praised options, it comes with a maximum concentration of deterrent as allowed by the law (2.0 %). Due to this high concentration, it’s one of the top rated bear mace formulas. The disperser is also designed for maximum coverage of the target area. Once you start pushing, the container delivers a heavy fog of spray with an improved accuracy, making it super easy to handle. It’s the best bear spray for campers who need to feel safer but prefer a budget option. 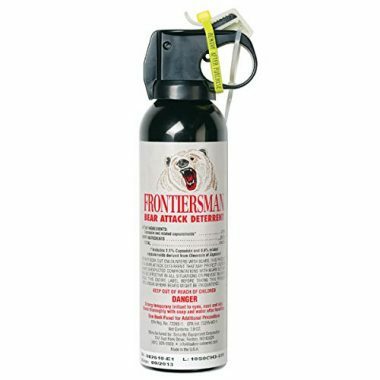 As far as we see, the only downside of the Frontiersman bear spray is that it doesn’t come with a holster. 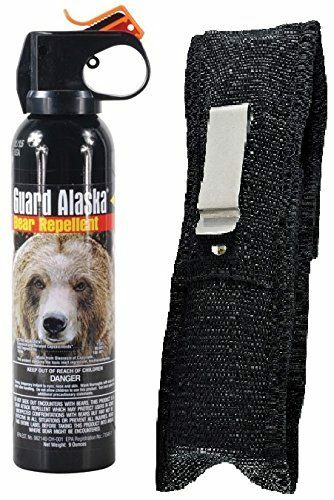 Still, if you previously owned another bear repellent spray that expired (or which you used up), you can simply use the holster belt leftover from that previous purchase. A bear pepper spray formula developed after years of testing in the Alaska wild, the Guard Alaska formula is a hikers’ favorite. Even though all of the other products that made it to our list of the best bear spray options are effective against all species of bears, this one is the only one recognized as such by the EPA. It comes with a metal clip belt holster so it’s easy to carry and reach for. It features a high strength concentration (1.34% capsaicinoid formula) which can be released completely over 9 seconds, or in shorter bursts. Also, for those of you with a green thumb, rest assured that the Guard Alaska bear repellent is environmentally safe. The spray doesn’t contain any polluting or ozone depleting substances. It’s the best bear spray for hiking in an environmentally-conscious way. One of the best bear spray formulas on the market, this repellant is derived from naturally occurring substances derived from hot peppers. The active agent is oleoresin capsicum, which is immediately effective against bears and other wild animals but decomposes in a non-toxic way in nature on the long term. This makes it a green product, safe for the environment, while still effective for getting yourself out of a hot spot. The Mace Brand bear repellent spray has a higher distance range than other similar sprays (up to 35 feet, compared to the maximum range of 30 feet of similar products). It’s a rather small recipient, and the entire content empties in 6 seconds. The spray is easy to grip and use, due to the finger loop handle and the extra safety clip. This means it won’t accidentally discharge while you hike or travel, but it also means you’ll be able to use it fast if a dangerous moment comes. Caution: this is a training spray! No active ingredients! This means that it’s only meant to teach yourself (or others) how to use the real stuff without actually wasting actual bear repellent. Also, if you were to learn how to use bear pepper spray using an actual container of formula, it wouldn’t only be a waste but even dangerous, if the substances were to accidentally reach you. We highly recommend you to get one of these and practice using it before you actually hit the trail or go on the nature trip you have in mind. Once you learn to use this spray, you can go ahead and buy any of the top-rated bear mace formulas you can find online. 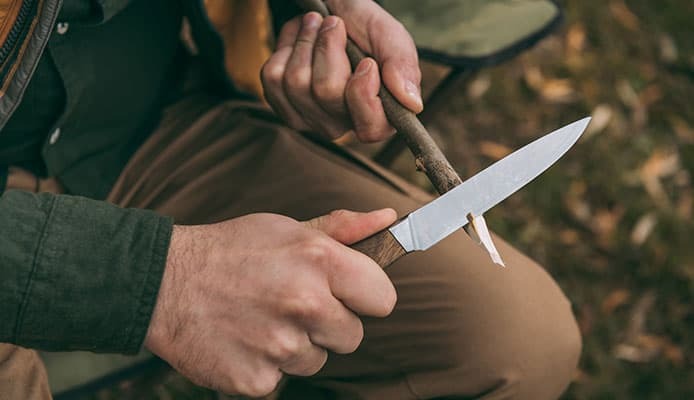 It’s true that it has the exact same mechanism and shape as the Frontiersman bear repellent spray, but it’s still good training for the other brands as well. There’s no pepper irritant in this practice canister, so if you don’t get it right the first time you try using it you risk no injury. We know that there are many options out there, and all of them are boasting to be the best bear spray ever. Choosing one can be confusing, and even after you make a purchase, you may still have a nagging feeling that maybe you could have chosen better. Especially since this is a matter of safety, fretting about whether you picked the best bear mace formula is normal and expected. So, how can you stress less? By reading on, of course. We’ve explained exactly the factors to have in mind when choosing a reliable bear spray for hiking and whatnot. This way, if you know what to look for and what each feature on the label actually means, you’ll have more peace of mind after you choose a bear spray. The maximum range any product on the market offers is 35 feet, though most options (even the best ones) usually offer a range of 25-30 feet. Bear in mind that this may be an overstatement in most cases, and the actual range you achieve when spraying the product is likely to be less (around 20 feet). It’s not that the promise on the label is false, but the actual reach of the pepper fog can depend on a lot of other factors: wind speed and direction, your hands’ strength, your familiarity with this kind of spray device and so on. As a minimum, look for products that can guarantee a range of at least 16 feet. That’s the actual recommended minimum range for this type of product. If the bear spray you’re considering has less than 16 feet range on the label, move on to the next option. Most likely, you will use this when the bear is closer to you than the maximum range advertised on the spray can. This is for two reasons. First of all, the further away you spray the bear mace, the less effective it is. Obviously, when you spray it closer to you the fog remains more concentrated and is thus more effective. Second of all, most bears actually avoid humans so it only makes sense to start spraying if you see the bear come up close and charge at you. This means you’ll be spraying at a pretty close range, but this is no reason to get scared and panic. Bear sprays are so effective that they’re proven to work in exactly this sort of situations. The best bear sprays are available in a capacity of at least 7.9 ounces of spray, because that’s how much active product is needed for actually deterring a large animal. This quantity of product will give you between 6 and 9 seconds of continuous spraying until the canister is completely depleted. Some of the top-rated bear mace options on the market come in larger amounts (such as 10.2 ounces). This can give you an extra second or two or spraying, which can be reassuring, especially for beginner users. Don’t worry: that spraying time is more than enough for the bear mace spray to do its job. Whether you spray it all at once or in short bursts directed at the animal approaching you, these almost 8 ounces of bear pepper spray are calculated to be enough to get yourself out of the tight spot. The animal will either leave or be incapacitated long enough for you to make your escape. Besides the range and the concentration, other features you should pay attention to when shopping for a bear spray could be the holster and or the environment impact of the formula. About the holster and belt: the bear spray you’re using must be at hand should you come face to face with a bear. Such encounters can happen all of a sudden (especially in the area known as Bear Country, but also in any of the mountains popular with hikers and campers). If you have to rummage around your backpack for the spray, it may be too late. So, in order to reach it easily, you have to carry the bear spray container around your belt. The best bear spray products offer a holster to go with the container, but also tend to be more expensive because of that. About the ingredients in the formula: basically, all of the best bear mace sprays are based on a high concentration of capsaicin-derived substances. It’s like a pepper spray used for self-defense against humans, but much more powerful, in order to be effective against bears. Still, some formulas are more environmentally-friendly than others. If you’re concerned about your impact on nature and the ozone layer, than make sure you go for a formula that promises a low impact. The strength of the bear mace spray you will be using depends on two factors: the concentration of the active ingredients (the actual pepper components) and the quantity (which directly translates to the total spraying time you can get from the can). The concentration can vary between 1% and 2% (this 2% being the maximum allowed concentration according to the law). The best bear spray formulas, which are considered to be quite strong, have a concentration of capsaicin-derived substances of at least 1.3%. As long as you see that on the label as a minimum, you can rest assured that your chosen bear repellent is a strong one. As for the quantity, the bigger, the better, of course. If the quantity of pepper spray is more generous and thus, you’ll get more seconds of spraying time, you stand a better chance of the animal getting engulfed in the pepper fog and getting deterred by it. Even if you kind of spray it in the wrong direction until you get a better grip on the situation, if there’s a bigger quantity in the spray container you can still be sure that it will do its job even if you ‘waste’ a second or two. As we mentioned above when discussing the best options, most bear mace spray products have between 6 and 9 seconds of continuous spraying time. This is enough to stop a bear which is charging towards you, even if you waste 1-2 seconds with a bad initial aim. If you press the spray button in a few short bursts, the bear mace will last even more than those 9 seconds. Still, you should bear in mind that the bear spray is enough for only one encounter. If you are indeed faced with a wild animal that could pose a danger to you, you will need to use up the entire contents of the spray can to deter it. As for the duration of storage, the best bear spray products remain active and effective for at least 2 years from the date of manufacturing. In some cases, even a long shelf life of 3 years is advertised. If you buy a bear mace spray but don’t have a reason to use it (hopefully), then make sure you dispose of it in a safe way before investing a fresh one to carry along on future trips. A reliable bear repellent spray can work against a bear which is in your vicinity, even if the animal is not (yet) charging towards you. It creates a so-called barrier against the animal, if you spray a few puffs in the next 5-10 feet that are around you and in the direction of the bear. To create this barrier, you should aim for the path it would take for the animal to reach you. This way, if the path is clouded by the pepper fog, the animal will not be inclined to go towards you. This effect can last long enough for you to go away. Still, this is not a permanent barrier. Don’t be tempted to use this as a precaution, like for spraying it around your camping area before you turn in for the night. Some studies indicate that while bear pepper spray will deter a bear when sprayed directly at it, the formula can actually attract bears if you just spray it on the ground. The spray is deterrent only when the animal is in direct contact with the formula, but can otherwise make it curious if it’s just a scent in the distance. Even if some bear mace sprays will say ‘length of reach’ on the can label, this is actually more or less the same with the range, which we discussed above. Most of the best bear spray options go as far as 30 feet, with exceptions boasting a reach of up to 35 feet. Realistically, you can expect around 20 feet to be the actual length of reach for most bear sprays. It may not sound like a lot, but it’s all you’ll ever need. After all, bear spray is not meant to be used as a preventative measure or as soon as you see a bear. In the vast majority of cases, bears will actually go away on their own once they see you. Only bear moms or animals in exceptional conditions will actually charge at you, and this is exactly the circumstance in which the bear spray is needed. So, if you spray the formula on the path between you and a bear which is approaching you fast, you will actually only need a range of 10-20 feet. This is a mark easily accomplished by all of the best bear spray brands available in stores and online. You want a bear pepper spray which is easy to use, of course. At the same time, you should make sure that there is a safety system in store as well so that the canister of bear mace doesn’t accidentally discharge. Therefore, the best bear sprays actually have a mechanism that achieves a balance between ease of use and safety. How can you make sure that it will be easy for you to use the bear mace spray should the need arise? Well, the best thing to do is to practice with a training spray (such as the one listed at #6 in our top above). This way, there can be no surprises. You’ll know exactly what to expect and how easy or difficult this can be, how hard you need to press and tug and so on. Second of all, you should look for a spray can that is especially designed for an easy grip and handle. You never know how you may become a tad panicky in the face of an actual bear, and your dexterity with the can may be affected by your emotions. If the spray container has a grip handle that follows the shape of your fingers you will find it more natural to maneuver it. The size of the canister is usually as large as the total contents of spray formula within tends to be. More product inside leads to a bigger canister, of course. So, we understand that you’d ideally like a smaller can so it’s easier to carry around, but in order to have enough product for warding off a bear, you need to settle for the standard size. In the case of the best bear spray formulas (such as the ones included in our top here), this standard size amounts to around 9.9 per 2.5 per 5.8 inches, just to give you an estimate of the size you can expect. Considering that you will need to carry the spray canister in a holster in your belt, expect the final bulk of the bear spray to be a tad bigger than the dimensions above. Q: What Is A Bear Spray And How Does It Work? A: A bear spray is a bear deterrent formula contained in a spray can, intended to help you escape a bear which comes to close to you or is attacking. The formula is similar to a pepper spray used in self-defense, but much stronger, fit to deter an animal of a much larger size and ferocity than a human attacker, of course. As far as active ingredients go, both kinds of formulas are based on capsaicinoid-derived components. Capsaicin is the substance that makes hot peppers spicy; the more a pepper has of it, the hotter it gets. Pepper spray and bear spray both contain highly concentrated amounts of these substances, in a much higher concentration than you could find in nature. This acts as a powerful irritant and mild paralytic agent for humans and large animals like bears. It will allow the user to get away from danger while the attacker (in this case the bear) is incapacitated. According to government data (from a study presented at the end of this guide), bear spray is effective in over 92% of bear attacks and encounters, whereas firearms are only effective in a little over 50% of cases. Impressive, right? 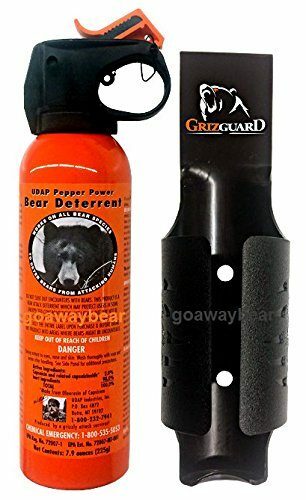 Not only is the bear pepper spray more effective than firearms against a bear attack, but it’s also a more humane solution for protecting yourself in the wild. A bear affected by bear spray will have no difficulty returning to a normal state of health and physical comfort after a few hours. Nature can resume its course, and you will have gotten away from a dangerous animal without actually putting it down. Q: How To Use Bear Spray? A: Bear spray formulas are generally easy enough to use once you get the hang of it. It’s best that before you go hiking or camping with an actual container of bear mace spray, you practice using it with a training can. After all, if and when you will be faced with an actual charging animal, you need to move fast. That speed will not come from the spray can’s ease of use, but will stem from your own familiarity with the spraying mechanism. Number 6 on our list of recommendations above is one of these training sprays, we highly recommend testing it out and learning to use it before graduating to actual pepper spray. For most best bear spray brands, the mechanism is activated like this: there’s a safety clip that needs to be tugged, flipped or removed. After that, the button that actually sprays the formula can be fully used and the contents of the can is ready to be dispersed. Once you remove the safety clip, you point the spray towards the animal if it is right next to you, or towards the middle of the path between you if it is charging. Next, press the spraying button and keep it pressed in order to discharge the bear repellent substance, just as you would use a regular spray. You can choose to do it in shorter bursts if you prefer, or if you’re worried you will exhaust the entire contents of the can too fast by spraying continuously. Q: When To Use A Bear Spray? A: Obviously, you should only use bear spray when a bear gets close to you (closer than 40 feet) and you feel in danger. But there are 3 different scenarios for a bear-human encounter, and a bear repellent spray should be used differently in each. Let’s take a look at these 3 situations. What to do: Resist the urge of using the spray at such a high distance. It won’t work: bear spray is not meant to scare away bears in your vicinity, but to deter bears that are actually coming to attack you. Spraying it in their general direction from a distance will not affect them and may even attract them closer. You can only start using the spray when the bear is 30 feet away from you. Once the animal starts closing in, you can spurt short sprays towards the middle of the path between you. This should deter it from coming even closer. What to do: Aiming the spray can downward and ahead of the bear (the middle of the path between you), keep spraying short puffs. Make it so the bear has to pass directly through the pepper fog if they want to get closer to you. If the bear continues to charge and gets too close, the bear spray should render them incapable of attacking anymore. If the bear is already too close (less than 15 feet), you can aim directly towards its face and eyes. What to do: We know this sounds scary and be assured that there is a very little chance that it should ever come to that. Still, just in case a bear appears out of nowhere and begins to attack you before you had a chance to start using your spray from a greater distance, here is what you need to do. Spray directly towards its face and keep spraying continuously until you can curl up and protect yourself. Once the bear is paralyzed you can move out from under it and run away or go get help. Research indicates that even if you get to this scenario, using the bear pepper spray will allow you to get away with only minor injuries, if any. Q: How Effective Is It In Deterring Bears? A: The best bear sprays are officially recognized (by government guidelines and regulations) to be the most effective way of protecting yourself against a bear. They are even more effective than firearms: according to a study linked below, firearms can protect you from getting attacked during a bear encounter only in 50% of cases, while a bear mace spray is effective in over 90-92% of cases. As an added bonus, unlike firearms or other weapons, bear spray causes no actual permanent damage to the animal. Much like pepper spray used against a human attacker, the formula will only stun the target, causing irritation and mild paralysis, until you can safely get away. Then, after a few hours, the animal will make a recovery and will be able to resume their life in the wild as before. If anything, the bear will learn from such an encounter to stay further away from humans. This will be good for the bears and for people as well, so there’s no harm done. A: Regular pepper spray was invented in the 80s for self-defense and it was formulated for use against humans. It delivers a strong punch meant to temporarily stun and cripple a human attacker until their target can get away or call in the authorities. A bear spray is formulated in a similar way, but its concentration is much higher, intended for a large and aggressive animal that needs to be deterred immediately. It will render it harmless until you can quickly move out and find another camping area far away from the animal. A pepper spray would be ineffective if used against a bear, while a bear spray would be too much if used against a human (and could cause permanent, serious damage). Therefore, you could say that the only difference between pepper spray and bear spray is the scale and intensity of the formula. Q: Is Bear Spray Required? A: Bear spray is not required as a mandatory safety measure, even in areas which are known to have plenty of bears around. It is entirely up to you if you choose to have a bear repellent spray with you as a protection measure. Our recommendation is to invest in one, for better peace of mind. Even if you don’t run into a bear, it’s better safe than sorry, right? A bear canister, on the other hand, is indeed required before you can enter such areas. A bear canister is a food box specially designed for storing food and other typical camping items that attract bears. As long as you use a bear canister you will not attract bears to your campsite. Here is more advice on storing food around your campsite. Q: Is Bear Spray Illegal? A: Bear spray is most definitely legal and the best bear spray options on the market are actually also FDA approved, so you can make sure that they’re both effective and safe to use. Still, you should keep in mind that some natural parks and reservations are allowed to restrict and forbid the use of bear mace spray. 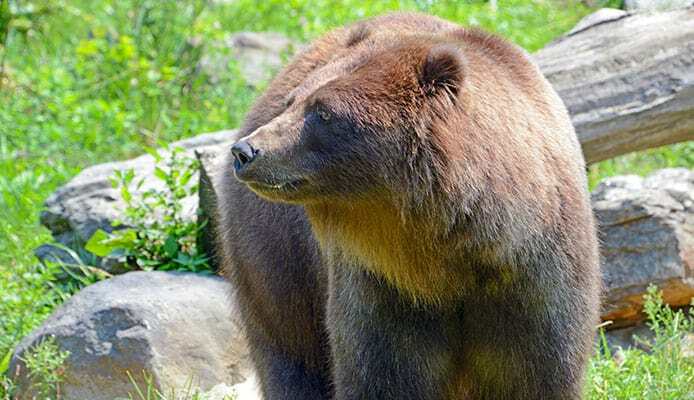 Some areas have protected or endangered species living within their perimeter and if visitors use bear spray in their proximity it could be harmful to the animals. So, what can you do in this case? First of all, make sure you inquire about the rules in the area you plan to hike or camp in. If bear spray is restricted there, you should know ahead of time, instead of risking a fine or worse. Second of all, if the use of bear mace spray is indeed forbidden in the place you’re planning to go to, you need to have a back-up plan should you encounter a dangerous animal. For example, you could join a guided tour with a larger group of people, and so on. You may find that ordering bear spray online is sometimes restricted from air shipping, which may lead you to question its legality again. Don’t worry: bear spray is most definitely legal across the United States, even in the states where the use of self-defense pepper spray is illegal. Actually, in such areas, there are even cases of people keeping bear spray in their homes for the purpose of fighting attackers should there be a break-in. But even if it is completely legal, bear spray is restricted to be carried by airplane. All this means for you as a customer is that you’ll need to wait a bit longer until your parcel is delivered if you order your bear spray online. Also, if you need to travel by plane in order to go on the hiking trip of your dreams, this may also be a problem. You are not allowed to carry bear mace spray by plane, anywhere: not in the check bag nor in your carry-on bag. So, if you want to go hiking in another state, make sure you travel by other means than airplane or buy your bear pepper spray from local stores before you start your hike. Q: Where To Carry It? A: While hiking and camping, the bear spray container needs to be carried at hand, in a specialized holster on your belt. This way, should the need arise, you can react fast and use it before the animal can actually hurt you or anyone else in your party. A fast react time is essential, so keeping it in your hiking backpack or in the car trunk while away from it will not do. Until you actually get to the hiking or camping area, you can carry the bear mace spray in your other luggage or in the car trunk. As long as the safety lid or clip is not pulled, there is no risk for the liquid to get discharged. Still, as a precaution measure, it’s best if you wrap up the contained in a paper box or bubble wrap, just to make sure travelling and bumpy roads don’t cause any damage to it. Then, when you get to your destination and you’re ready to go out there and experience nature, just remove it from the extra packaging and place it in its intended holster and around your belt. You’re now ready to venture into bear country! Q: Can Bear Spray Hurt The Animal? A: As mentioned above, bear spray only hurts the animal in terms of irritation and mild paralysis, but the effects are temporary. It’s effective just to allow you enough time to make your escape and to deter the bear from coming close to humans in the future. While the bear should be able to get back up and feel comfortable again in a relative short time, it can take a few hours for the irritation caused by the pepper spray to completely wear off. In extreme cases, depending on the animal and its overall health or age, the effects of the bear pepper spray can last longer, for up to a few days. Sure, it’s uncomfortable and it does cause the animal a certain amount of suffering, but there’s no permanent damage involved. Considering that you still have to defend yourself somehow, it’s a much more humane option than firearms or weapons that would actually wound or kill it. You may wonder in this case why bear sprays are forbidden in certain areas, if it’s true that they cause bears no permanent damage or injury. Depending on the natural park or reservation you visit, there may other animals in the area that could get hurt by the use of bear mace spray. Usually, when there is a restriction in the use of bear pepper spray somewhere, it’s because of a need to protect smaller animals that inhabit the same region. Q: How Do You Treat Bear Spray If It Gets On Your Skin? A: Just like self-defense pepper spray, bear spray is highly irritant and even more so due to its higher concentration. The point of learning to use one by testing out a training bear spray can is precisely meant to avoid this kind of accidents when some of the product ends up on your skin. Still, if you find yourself in such a situation, don’t worry, it’s still manageable. First of all, if this happens during a bear attack, your main priority is still neutralizing the animal. Bear through the sting of the spray on your skin (if you can feel any) and focus on ending the encounter. Then, you can tend to the skin area that got contaminated with bear pepper spray. To treat the affected area, you can first soak a tissue in milk and lay it gently on the skin that got exposed to the pepper spray. Leave it on for 10-15 minutes and the milk should take some of the sting away. Also, make sure you remain calm: nothing bad can happen because of this, it will just be a bit uncomfortable until you manage to remove it all. Note that the milk will not remove the pepper oil from your skin completely, it will just take the edge off from the burning sensation. After you leave the milk-soaked tissue on your skin for a bit and start feeling better, you need to wash the area with a grease-removing product. Dishwasher liquid and water should be enough to remove the pepper oil from the skin. You may still experience increased skin sensitivity and tingling on that spot for a few days, but no need to expect any major consequences from this contamination. Just like a sunburn, it won’t be pretty, but it will pass. Still, it can be pretty uncomfortable while it lasts, so make sure to avoid it. According to a government study (linked below), using a bear repellent spray is more effective than firearms when facing a bear. When people used a bear mace spray formula during an encounter with an angry beast, only 2% of them were injured and even so, those injuries were deemed minor. Bear spray was proven to be over 90% effective in driving away both black bears and brown bears and it’s the safest method currently known of deterring them. So, whenever you’re getting ready to go on a hiking, fishing or camping trip, do yourself a favor and pick one of the best bear sprays above to take along. You never know when you may encounter a wild animal and having this repellant on hand might just save you from injury or worse. Have you ever used a bear mace spray? Did you find it difficult? Also, were you ever faced with an angry bear in the wild? Let us know in the comment section below! We’re excited to hear from camping enthusiasts of the Globo Surf community, especially if they have stories the rest of us could learn from.